The next GDP meeting is on March 13, 2019 (Wed) from 5:45pm to 7pm. “We want to hear your voice! Please take a few moments to fill out the OUSD parent survey. We want to know how to serve your family better. Por favor tome unos momentos para llenar la encuesta para padres de OUSD. Queremos saber cómo servir mejor a su familia. Xin vui lòng dành một vài phút để điền vào bản khảo sát dành cho phụ huynh OUSD. Chúng tôi muốn biết cách phục vụ gia đình quý vị tốt hơn. The OUSD Network Superintendent (LaResha Martin) will attend this Wednesday’s GDP meeting. The meeting is from 5:45pm to 7pm at the Lincoln Faculty Lounge. Children are welcome, and translation services will be provided. Please have your questions ready. TK-2 PARENTS ARE NEEDED. Reminder: The Contare Lunar New Year’s Concert is this Friday (February 1, 2019). Doors open at 6pm. 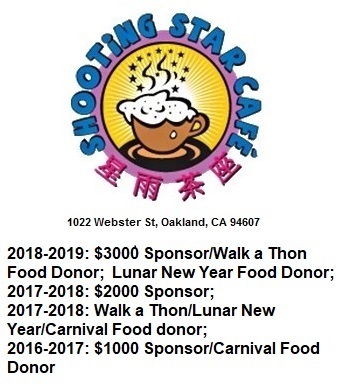 ADMISSION IS FREE, and SHOOTING STAR CAFE WILL DONATE DELICIOUS FOOD.